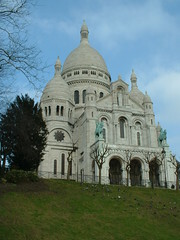 Sacre Coeur is on of Paris’ many splendid Catholic Cathedrals, though this one is much newer than most of the other European landmark Cathedrals like Notre Dame, Chartres, and Winchester Cathedral. Sacre Coeur sits atop the hill called Montmartre from where you gaze down upon the debauchery of Pigalle, the notorious red light district of Paris which includes the famous nightclub “Le Moulin Rouge”. The metro stop for Sacre Coeur is probably Paris’ most famous, called “Metropolitain” which was the gateway to inspiration for many of the world’s most famous artists such as Van Gogh, Renoir, and Degas who lived – often poorly – in the Montmartre region.